Comment Guard allows you to set up an opt-in message for anyone that leaves a Comment on your Facebook Posts, Boosted Posts, or Ads. Setting up a comment guard on a post or ad will allow your bot to automatically send a message to anyone who comments on that post. This is an incredibly easy way to grow your Messenger opt-in list. NOTE: Comment guards do not work on events. If you share an event URL on your page, Facebook will convert it into an event. Click on the FB Comment Guard tab in your bot builder and click "New Comment Guard". Decide whether you want to create a catch all comment guard or specified post comment guard. UPGRADE to Pro so you can choose to "Respond only to specified posts". Catch all comment guards will respond to all unguarded posts on your Facebook business page. If you have a comment guard on a specific post, and also a catch-all, the comment guard for ALL posts will be followed. If you choose to set up a specified post comment guard, enter your post URL or ID. The post ID can be found within the URL. Set up your initial message that will send to the users, and select the page from your bot that you would like to send. Comment guard behaves differently for people who have opted into your page's messages already vs. people who have not. 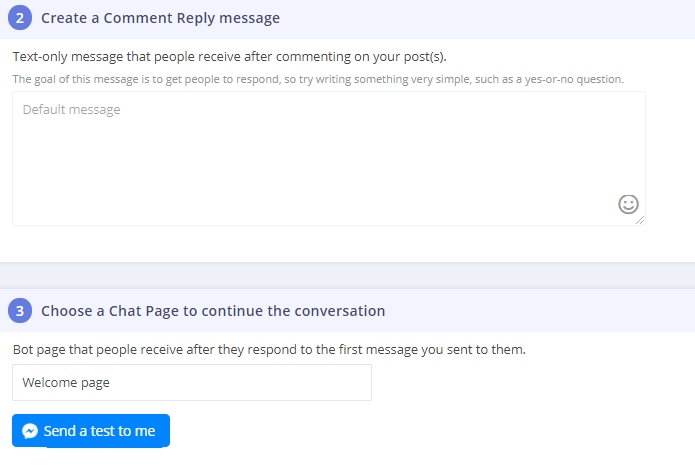 For people who have never messaged your page before, the comment guard will first send them an initial message that you choose. If they respond, they will be sent the bot page you specified, and they will be added as contacts. Remember to keep that initial message engaging! For people who have already opted in, the comment guard will send them only the bot page you specify, when they comment on your post. Set your frequency cap. This prevents your bot from sending out multiple messages to people who comment more than once on the post. Make sure your comment guard is active.